and detached houses) and geographical sub-markets. well as housing choice and senior citizens . land for higher-density housing development. Liu, et al. needs to be realistic enough. whole city by the end of 2008 was about RMB 3,290.
side of the scale, the lowest level was aro und RMB 1,400 . Figure 1. Map of urban districts in Shanghai. Table 1. 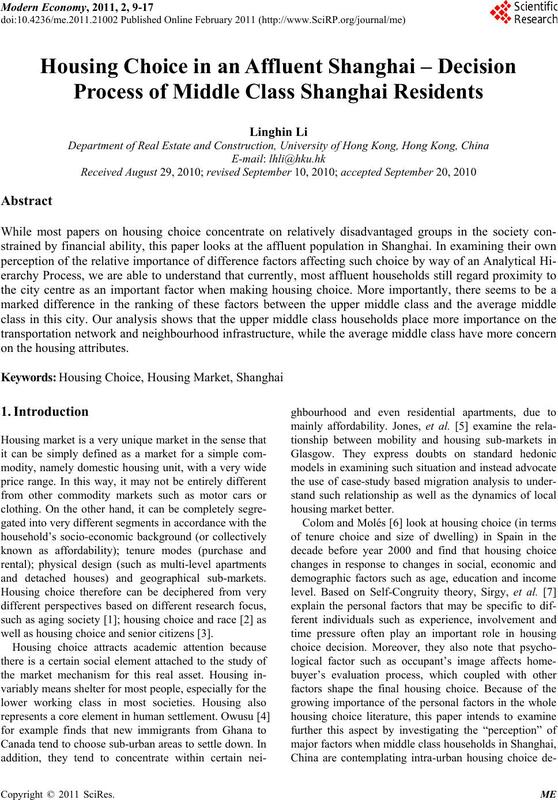 Relative intra-district mobility of residents in 2007 in Shanghai. therefore falls into this category of situation naturally. an optimal house selection decision. sources or as probabilities in making predictions. resent the progressive decomposition of the problem. tives) relative to achieving the top-most objective. eral problem into individual criteria. alternatives and encode using the AHP relational scale. level of hierarchy) relative to the top-most objective. ceding the filling in of the questionnaire. then indicate the extent of the difference in importance. satisfaction, since location affects commuting cost. 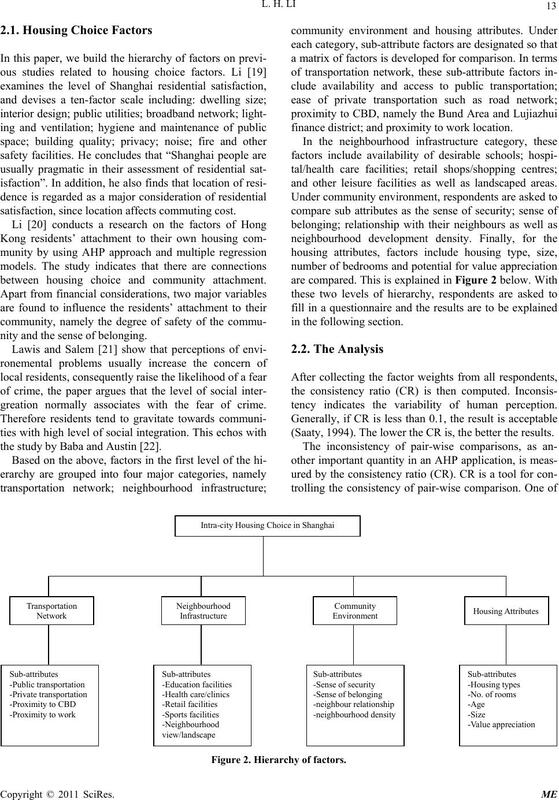 between housing choice and community attachment. nity and the sense of belonging. greation normally associates with the fear of crime. the study by Baba and Austin . finance district; and proximity to work location. and other leisure facilities as well as landscaped areas. tency indicates the variability of human perception. (Saaty, 1994). The lower the CR is, the better the results. Figure 2. Hierarchy of factors. logically sound and not a random prioritization. group are more inclined to look at Housing Attributes. two income groups. This is shown in Table 5 belo w.
Table 3. Consistency ratios of various factors. Table 5. 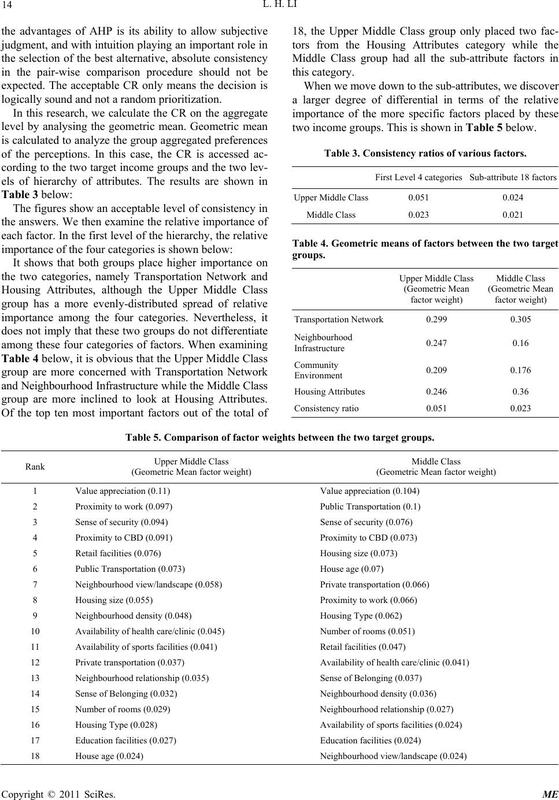 Comparison of factor weights between the two target groups. of the relative importance of these broadly-defined terms. population become more conspicuous and significant. with capital appreciation prospect of their housing choice. tors affecting popularity of housing units. ception between the two target groups begin to show. Middle Class again by more than 20%. CBD where most high-end retail facilities will b e found. place the factor of Private Transportation in a higher rank. lic and private transportation networks are important. sub-urban districts, just like their western counter-parts. with larger flats can be found. 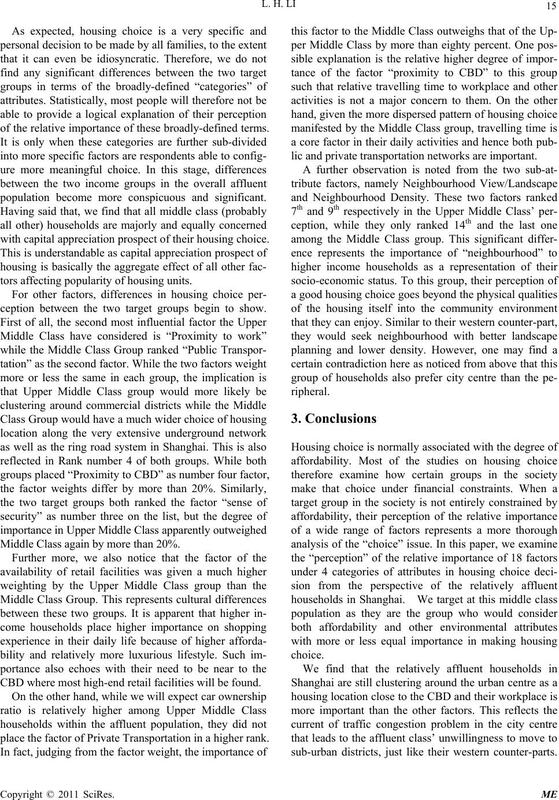 portant consideration when making a housing choice. Vol. 21, No. 3, pp. 315-335.
rary Sociology, Vol. 36, No. 2, March 2007, pp. 135-136.
ugust 2006, Vol. 12, No. 2, pp. 103-119. Studies, Vol. 14, No. 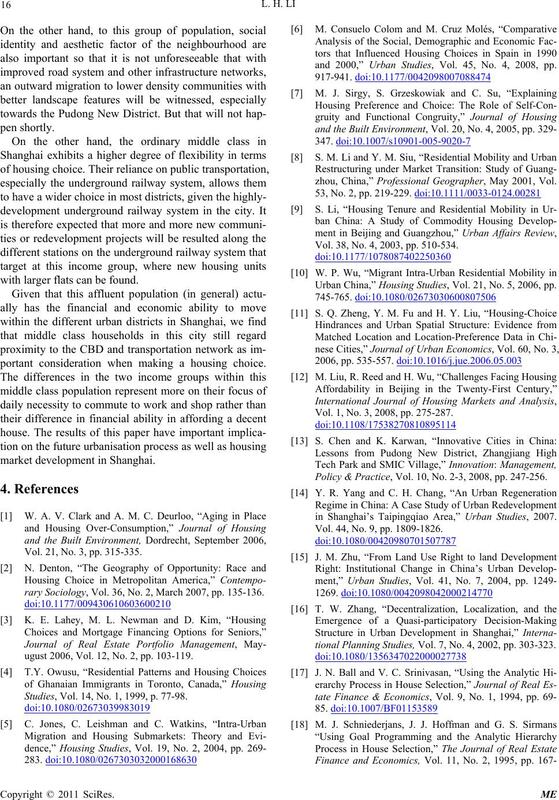 1, 1999, p. 77-98.
and 2000,” Urban Studies, Vol. 45, No. 4, 2008, pp. zhou, China,” Professional Geographer, May 2001, Vol. Vol. 38, No. 4, 2003, pp. 510-534. 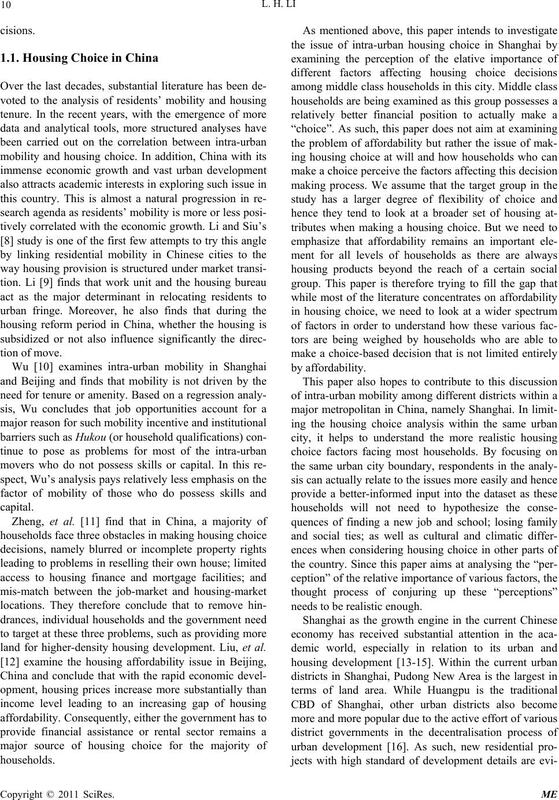 Urban China,” Housing Studies, Vol. 21, No. 5, 2006, pp. Vol. 1, No. 3, 2008, pp. 275-287. 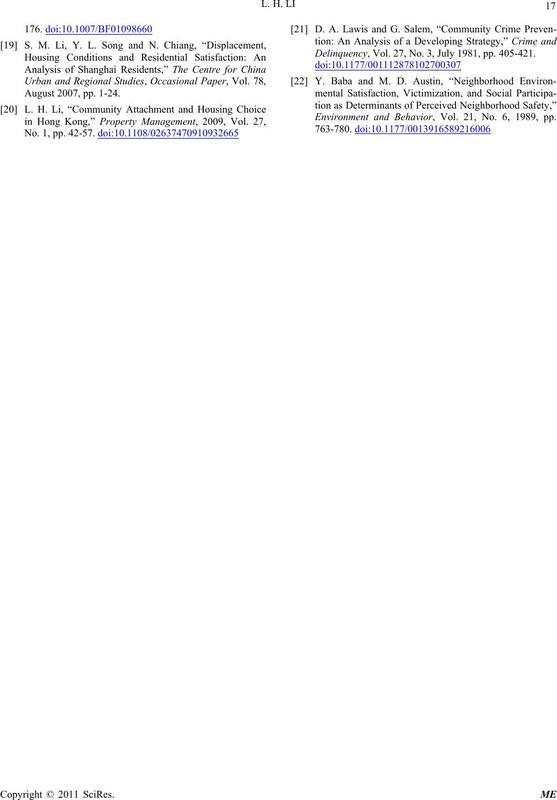 Policy & Practice, Vol. 10, No. 2-3, 2008, pp. 247-256.
in Shanghai’s Taipingqiao Area,” Urban Studies, 2007. Vol. 44, No. 9, pp. 1809-1826.
tional Plann i n g S t udies, Vol. 7, No. 4, 2002, pp. 303-323. Delinquency, Vol. 27, No. 3, July 1981, pp. 405-421. 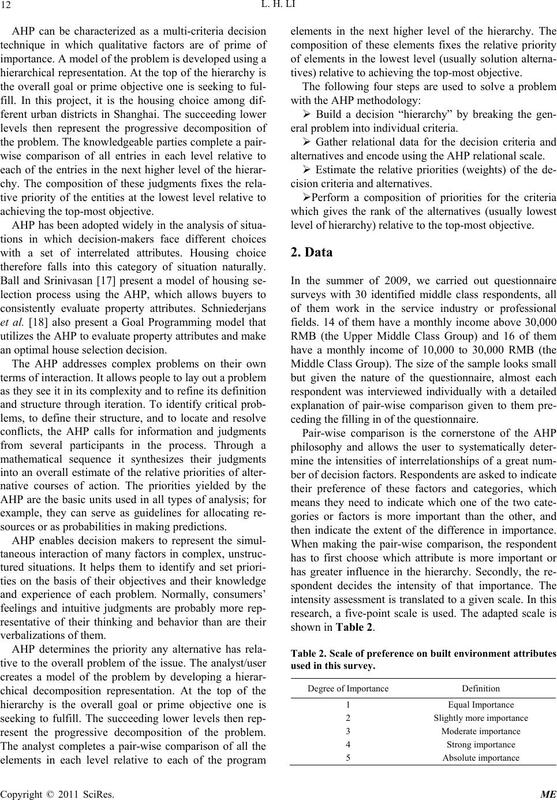 Environment and Behavior, Vol. 21, No. 6, 1989, pp.